Break down an Initiative into smaller work items. Using this approach you will create new cards via the Initiative. Link an Initiative to existing cards in the system to create a relation between the items. A child card will open -> fill in its properties (name, deadline, priority, etc.) and click on Add card to create it. This way you can create as many child cards as needed to outline your Initiative. Every card that you create is represented by a colored rectangle on the Initiative card. On hover, you can find details for the child card. Double click on the rectangle to open the card. 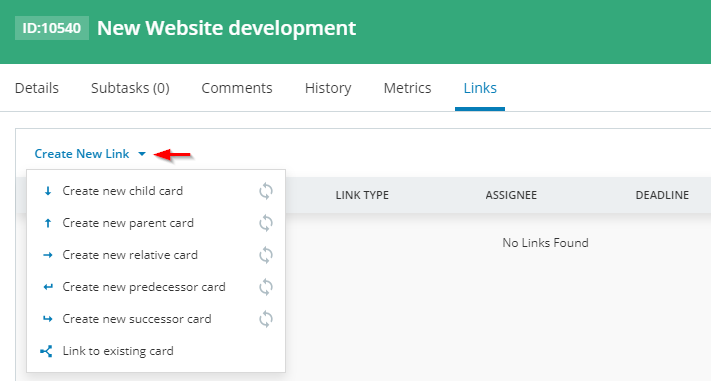 Drag & Drop an existing card from the Cards Workflow and attach it to the Initiative in the Initiative Workflow via the "Link the card as a child" function. Using this option you can select multiple cards and link them in bulk to the Initiative you have created. Click on the plus sign of the Initiative to create a new child card. Use the mini Boardmap to define the position of the child card. You are not limited on the number of child cards that you can create. Open the Initiative and use the Links Overview menu to link existing cards and set up a relation between them. Use the plus icon (+) to link the Initiative as a Child; Parent; Relative; Predecessor or Successor. Just select the type of connection and enter a card ID or a Title to refer to an existing card in the system and link the items -> Create a link. Double click to open an Initiative and select the LINKS tab. Select "Create New Link" to open a menu that displays the types of relations (img.1) in the system (child, parent, relative, predecessor, successor). Make your choice and use the mini Boardmap to define the position of the new card you are going to create. You can select the board and the column/lane. The last choice in the menu "Link to existing card" (Img.1) allows you to link the Initiative to an existing card in the system. Select it to open a supporting menu where you can select the type of relation by clicking the respective button. Then enter a card ID or a Title to refer to an existing card in the system and link the items via the Create a link button. The Links tab displays all linked cards in a list. Use the "Configure Results" button to display any card-related information that you want to have more visible. For example, you can easily add further details such as: description, tad, size, etc -> just select the pills from the configuration panel and Apply your changes. Use the Related Board feature to link cards. The Related Boards feature can be activated from the board sidebar. This feature facilitates the breakdown process of your work across multiple boards. For more information, please check the dedicated article.